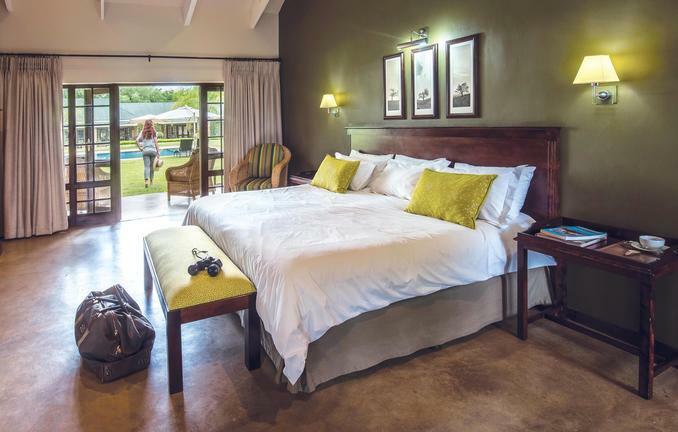 Set among Baobab, Fig and Acacia trees in the heart of the Colonial Perry’s Bridge Trading Post Centre, Perry’s Bridge Hollow Boutique Hotel is located only minutes from the Kruger National Park, and a short drive to the popular Panorama Route. 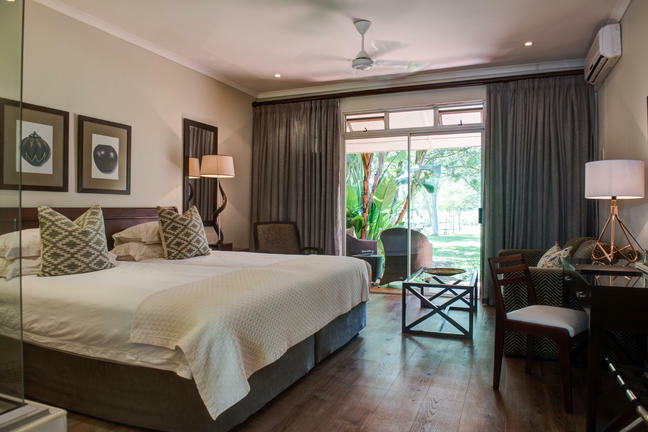 The hotel’s 31 spacious twin rooms and 3 family suites offer relaxed, yet sophisticated accommodation set in beautiful indigenous gardens. 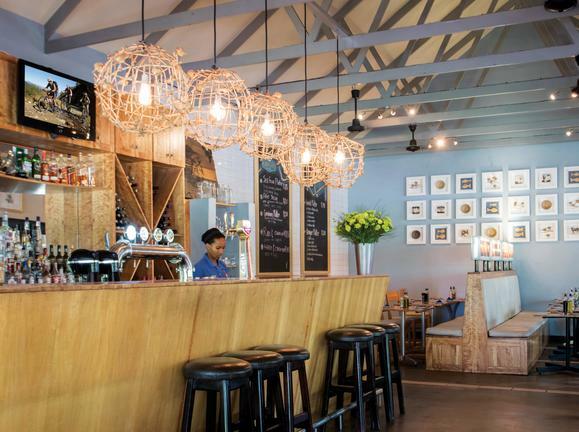 The on-site afro-chic Kuka Cafe offers contemporary dining at its best while time spent at the swimming pool in the peaceful garden setting, is bound to leave you feeling refreshed and revived. 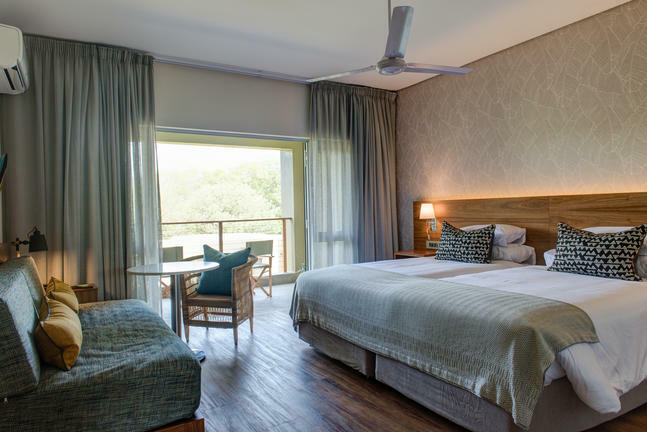 The elegantly designed rooms feature tea and coffee making facilities, mini-fridges, patios, satellite TV and free Wi-Fi, as well as indoor and outdoor showers. 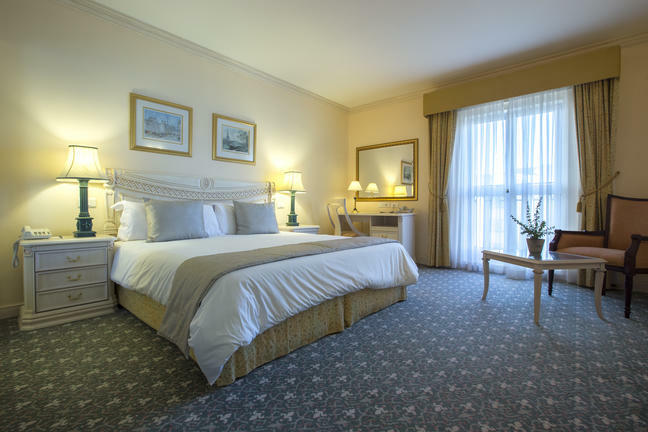 Upgraded rooms add separate sitting areas and claw-foot tubs. Perry's Bridge Hollow Garden Set amongst Baobab, Fig and Acacia trees in the heart of the Colonial Perry’s Bridge Trading Post Centre. 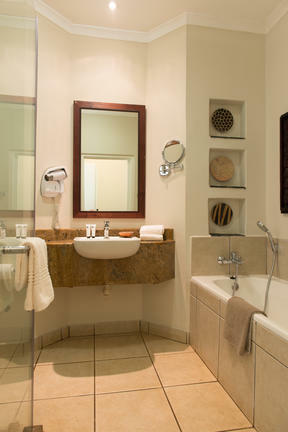 Hotel bathrooms All bathrooms are en-suite and offer an inside and outdoor shower. 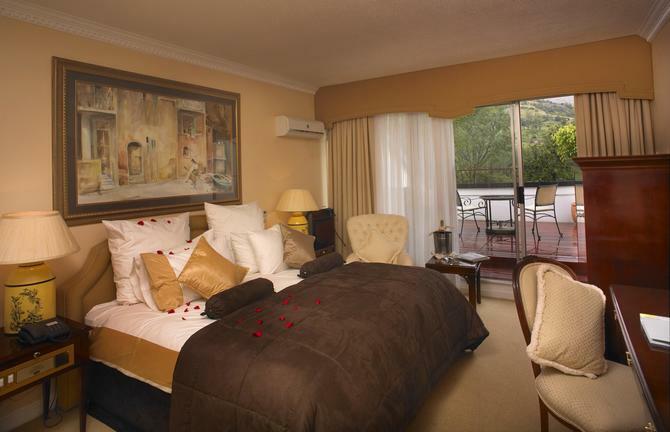 The 31 spacious rooms offer relaxed, yet sophisticated accommodation in beautiful indigenous gardens. 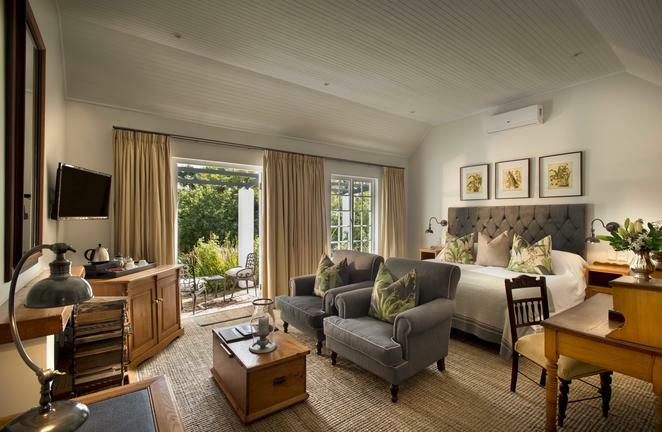 The 3 family suites offer relaxed, yet sophisticated accommodation in beautiful indigenous gardens. Kuka’s mood is sophisticated afro-chic presented in a modern open space, decorated with bright vibrant colours. 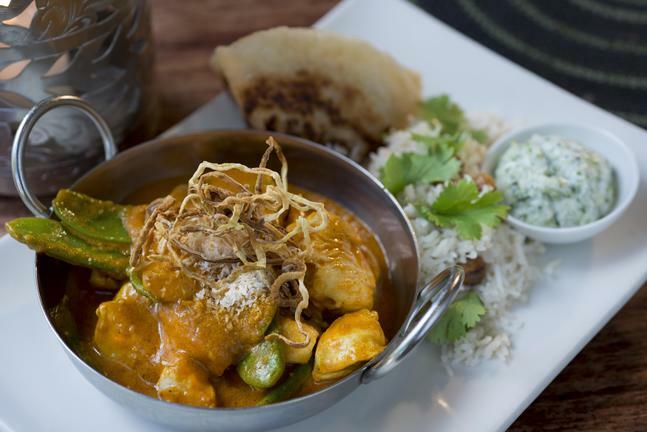 The food is a cosmopolitan African blend of everything your heart desires. 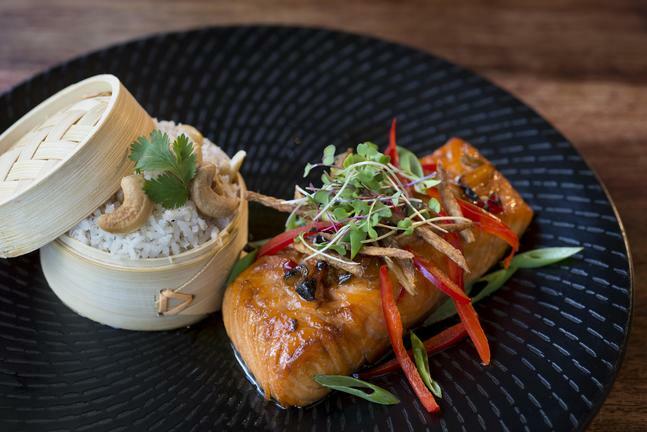 From sumptuous breakfasts, lunches and dinners, to coffee delights and superb cocktails, Kukua offers it all and more. 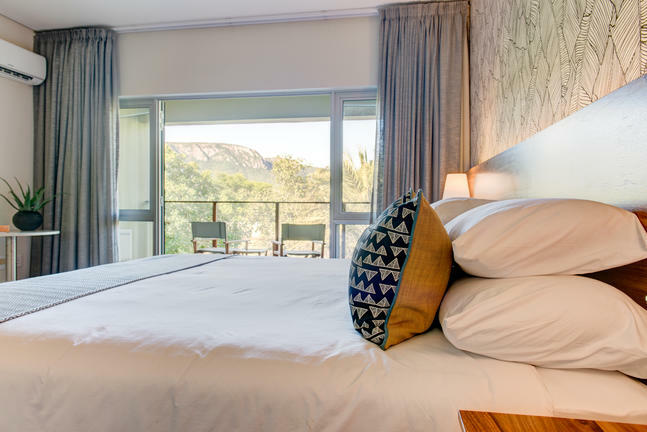 Resting in the stunning Ezulwini Valley in the spectacularly scenic kingdom of Swaziland, The Royal Swazi Spa hotel forms an integral part of the Royal Swazi Spa Valley Resort. 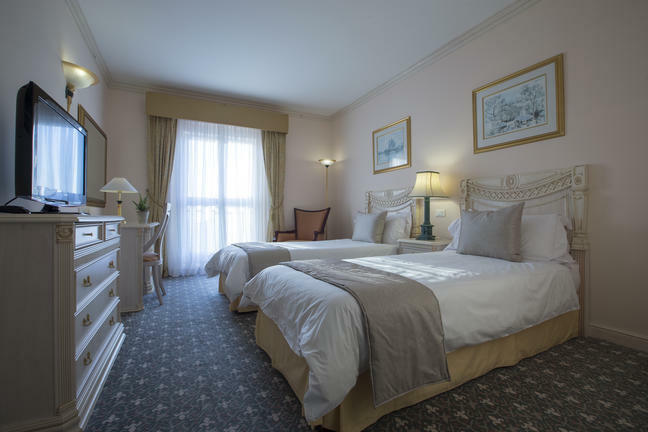 This luxurious hotel offers everything guests could ask for in one convenient location, with additional facilities to tantalise and entertain. 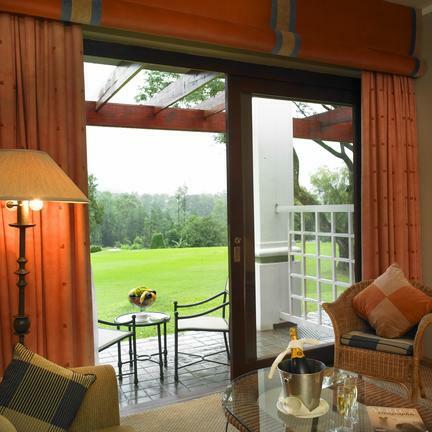 The combination of luxury accommodation, conference centre, country club, casino, elegant new health spa and even an extraordinary 18-hole championship golf course, make it the ideal destination for leisure visits, conferences, as well as sporting events and romantic getaways. 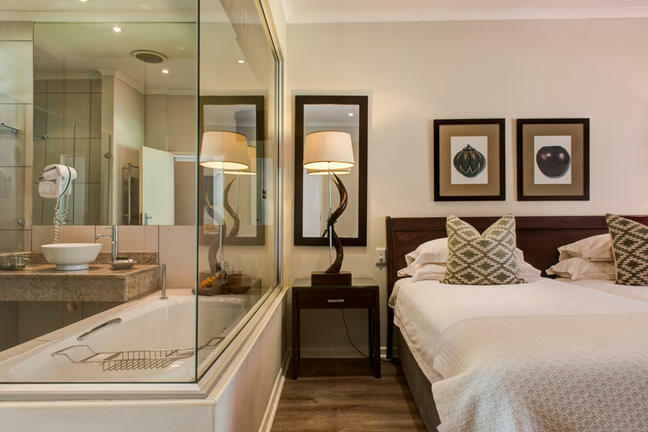 The Family Rooms consist of a king size bed with an en-suite bathroom that hosts a shower above bath. Another separate bedroom offers twin beds. 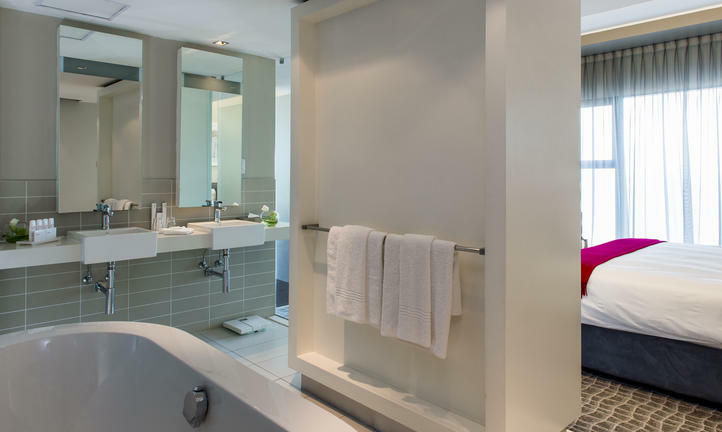 The King Rooms feature a king size bed and en-suite bathroom with a shower above bath. Interleading or smoking rooms can be arranged on request. 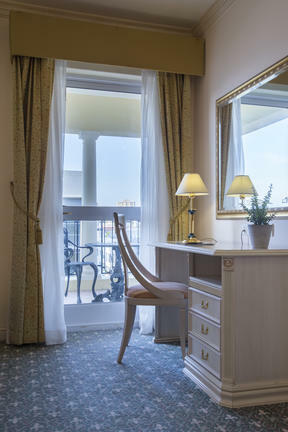 The Luxury Balcony Rooms consist of a king size bed and en-suite bathroom with a bath and shower. 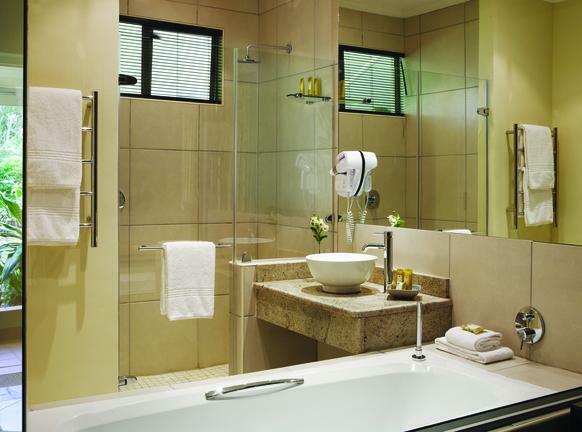 An expansive balcony completes the suite (Shower above bath). 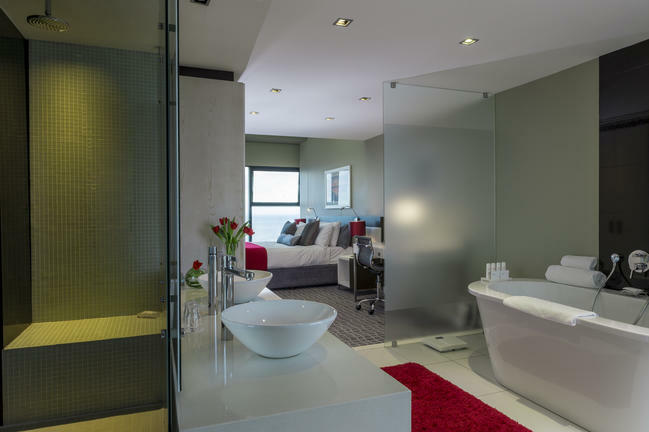 The Standard Suite is a spacious suite consisting of a king size bed and en-suite bathroom with a bath and shower separate. There is also a separate lounge area and writing desk. 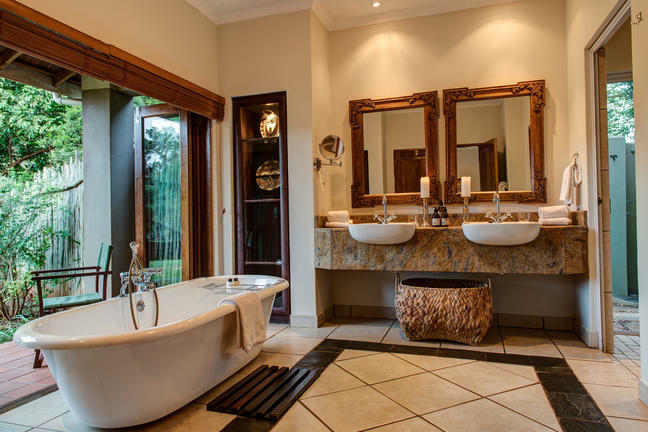 The Royal Suite is well-appointed with a king size bed and en-suite bathroom. 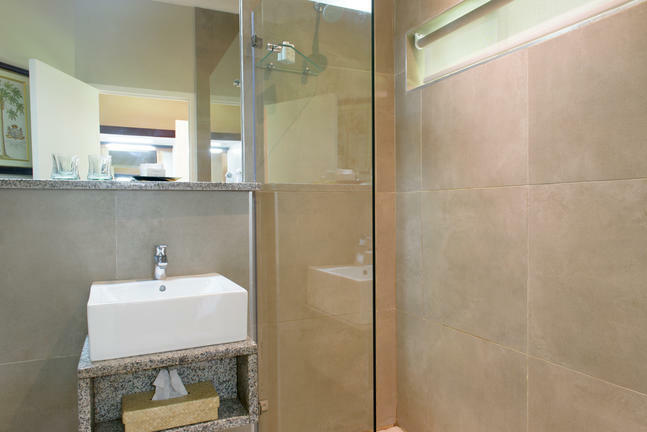 The bathroom hosts a walk in shower and twin vanities. There is also a separate lounge with a spacious dining area. 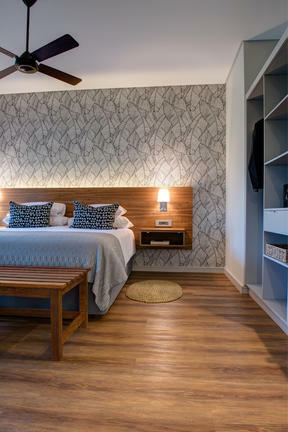 The Standard Twin Rooms have 2 twin beds alongside each other as well as an en-suite bathroom with a bath above shower. 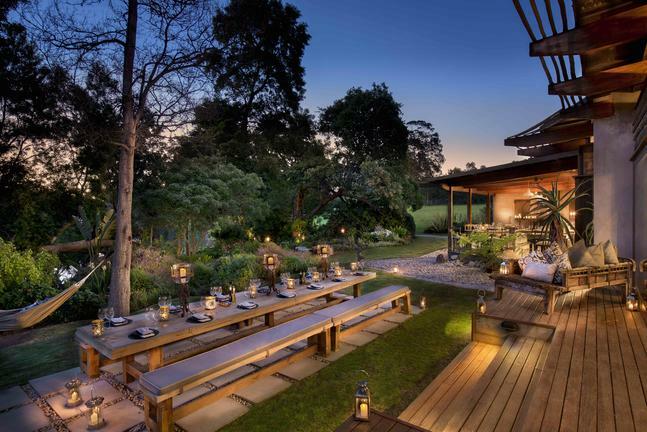 At the foot of the legendary Ghost Mountain in the charming little town of Mkuze in the Northern KwaZulu-Natal, South Africa, lies the privately owned, award-winning Ghost Mountain Inn. 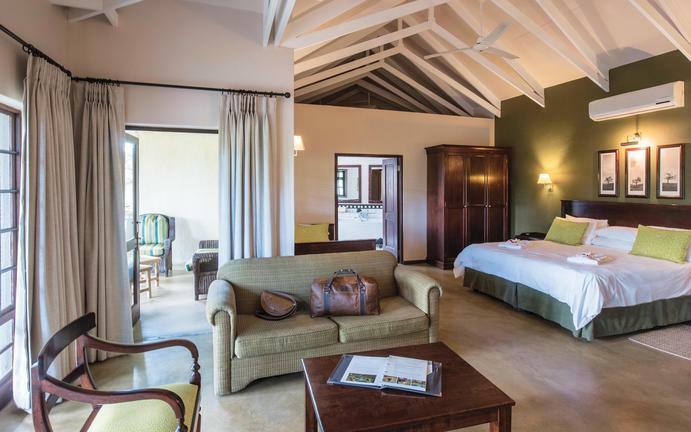 This beautiful, intimate hotel is the ideal location from which to explore the game and coastal reserves of the Elephant Coast. Discover the abundance of wildlife and scenic splendours of this rich and diverse region during game drives, guided walks and boat cruises in the company of knowledgeable rangers. Alternatively, be pampered with skin and body treatments at the on-site spa or simply enjoy the pools, gym and glorious indigenous gardens. Rooms at the Ghost Mountain Inn offer a private patio, a satellite TV, a minibar and a tea/coffee maker. Some rooms are more spacious and include a refrigerator. 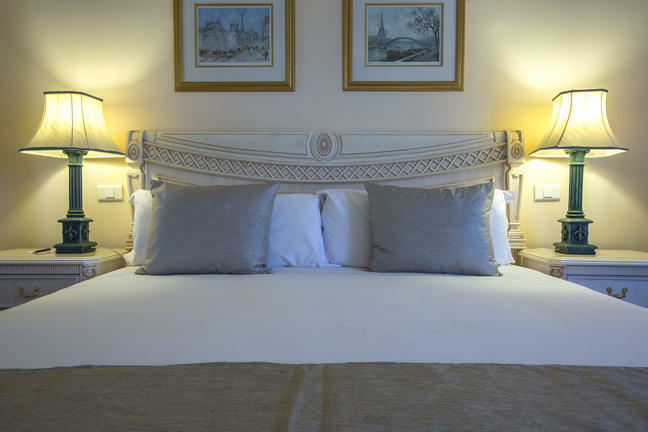 The original rooms of the hotel provide comfortable accommodation with private patios that hold views of the garden or courtyard. 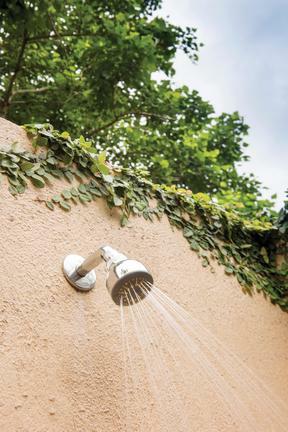 They offer a cosy place to rest your head and a bathroom with a large spacious shower. 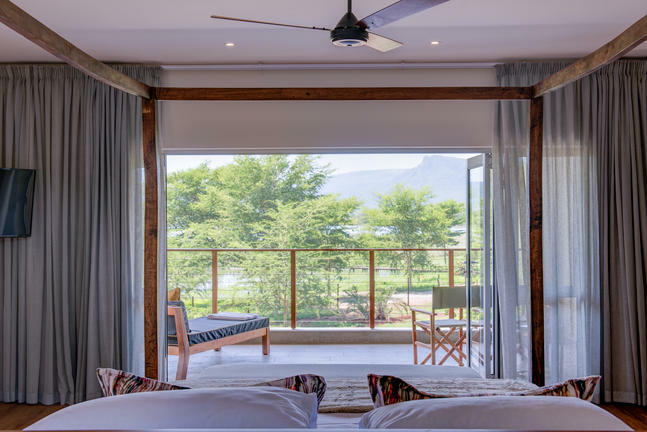 Enjoy great views of the gardens, water and Lebombo Mountains from these newly built spacious rooms. Featuring both extra length King and three-quarter beds with a day bed that can accommodate a third person if necessary. 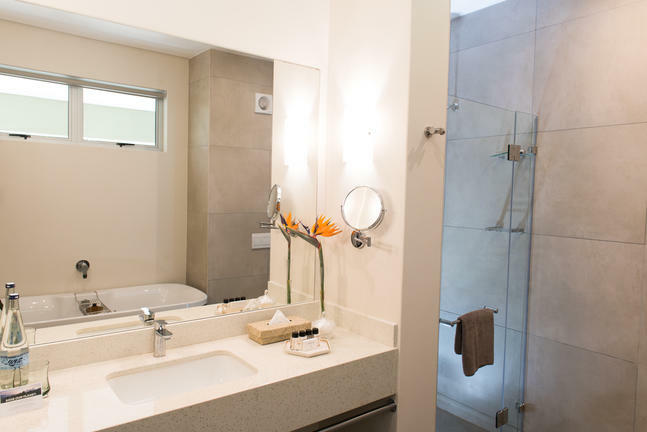 The spacious bathroom offers a deep soaking tub and separate shower. 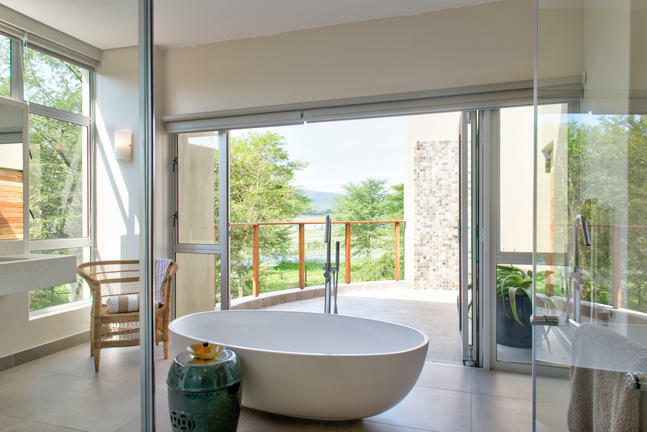 With secluded privacy, spaciousness and great views the Tshaneni Suite offers residential-style comfort during your stay in Mkuze. 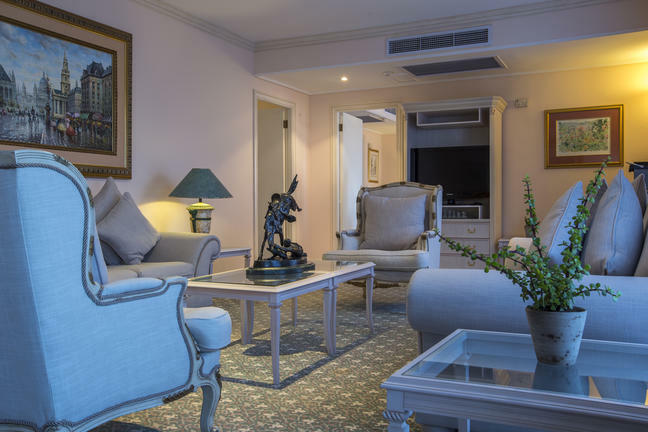 The Suite offers a living area with kitchenette and guest bathroom and a spacious bedroom with dressing room that leads out onto a large terrace. 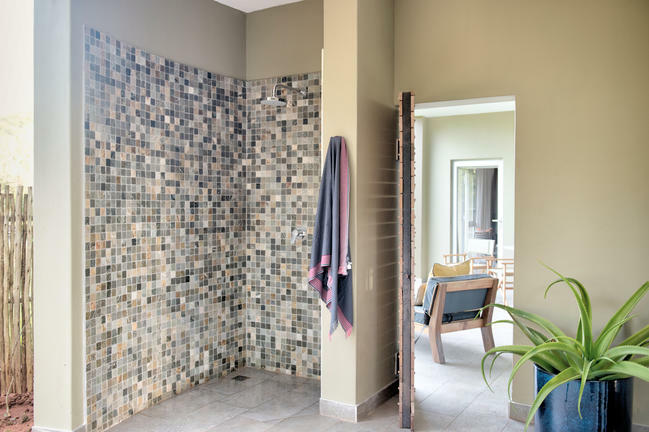 The bathroom offers indoor and outside showers and a standalone tub. 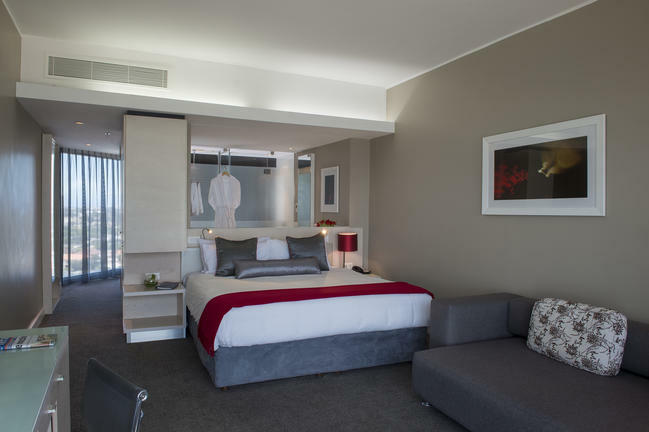 Our most spacious Suite, the Gaza Suite offers spacious accommodation for guests needing more residential style accommodation. 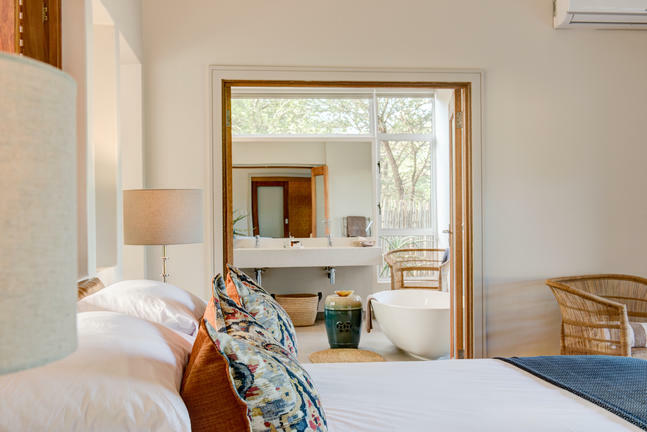 The Suite offers a living area with kitchenette and guest bathroom and a spacious bedroom with dressing room that leads out onto a large terrace in the garden. 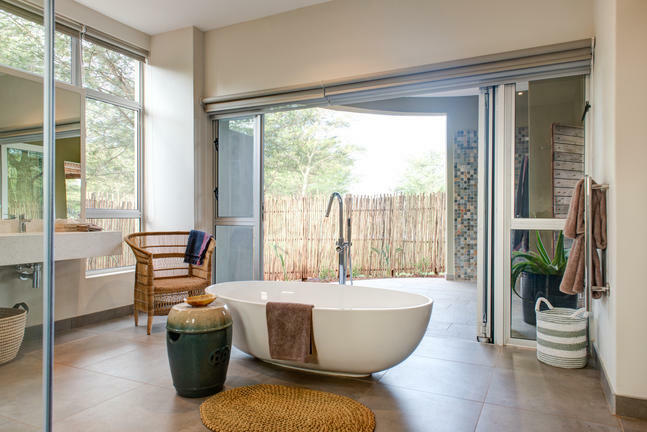 The bathroom offers indoor and outside showers and a standalone tub. 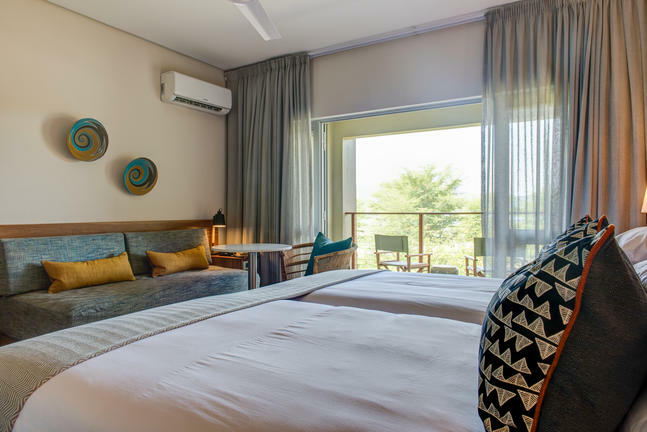 Located on the upper level the Junior Suite offers views across the gardens towards the Lebombo Mountains and additional space. Enjoy an open plan lounge area, a small kitchenette as a work area with complimentary WiFi. 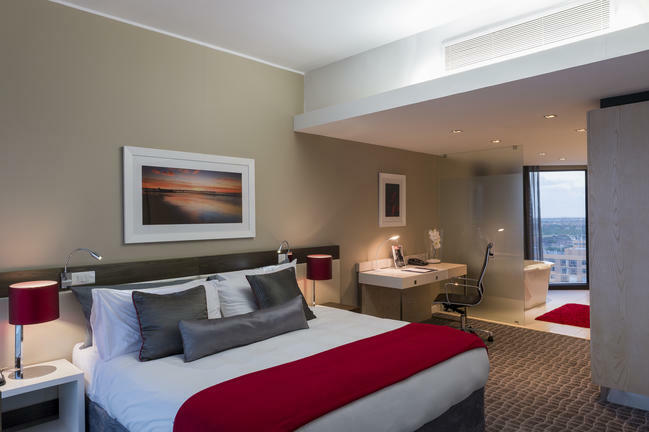 For families, a third person or children can be accommodated on the fold out sofa or an inter-leading room can be reserved to form a 2-bedroomed suite. 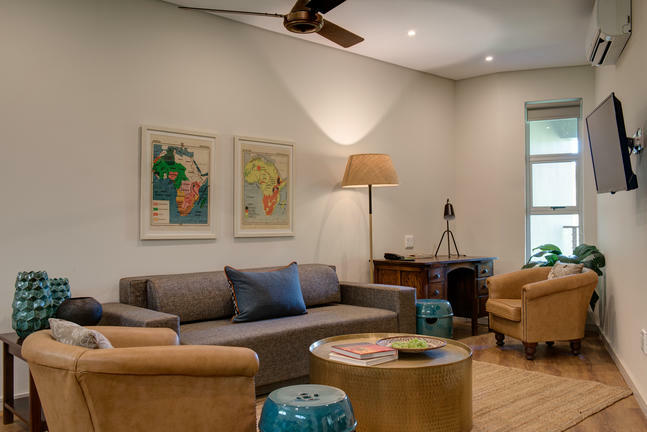 Set near the bustling nightlife of Florida Road, in the heart of the tranquil Durban suburb of Berea, The Benjamin is a sophisticated hotel occupying an exquisite tree-shaded colonial-era Victorian villa. 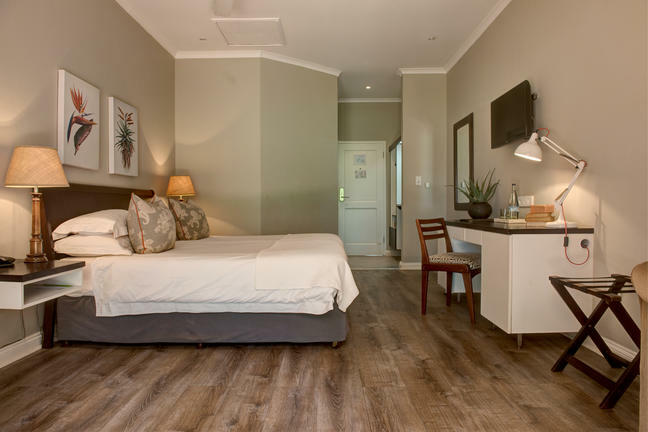 This elegant hotel features 43 well-appointed double rooms, all of which are air conditioned and offer en suite bathrooms, wireless internet, a coffee maker, hairdryer, desk and a flat-screen satellite TV. Most of the rooms have balconies and/or garden views. There is also an outdoor swimming pool, a comfortable lounge, a fully stocked bar, two meeting rooms and a conservatory-style breakfast room that serves a continental breakfast buffet. 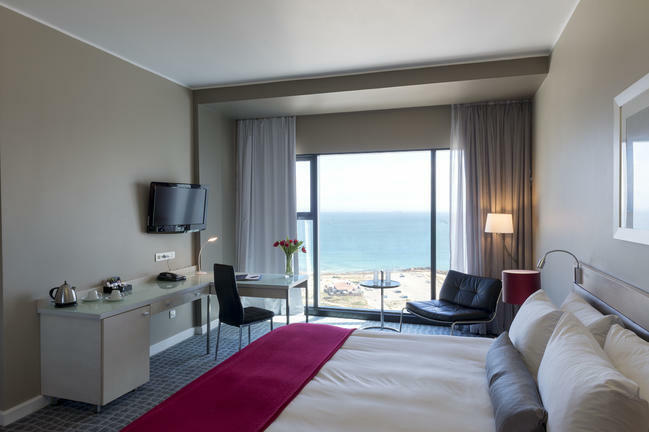 The hotel is within walking distance of a some excellent beaches as well as a number of fine restaurants where guests can enjoy lunch and dinners. 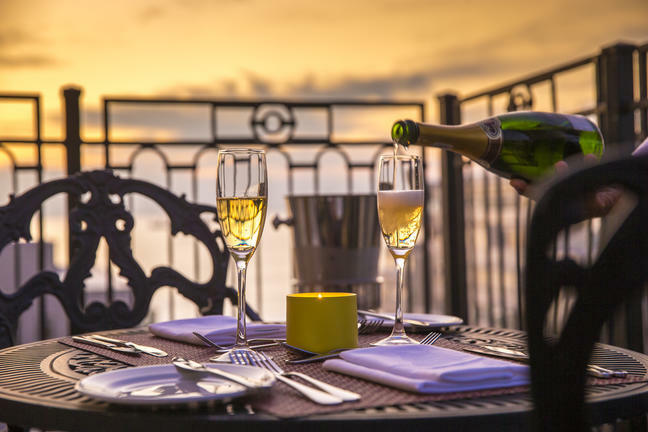 Dine at the Tabú Grill, where you'll bask in views of the Indian Ocean as you indulge in flavorful grilled dishes and an expansive selection of wines. Keep up with your fitness routine in our gym, or head to the Amani Spa to unwind. Our meeting facilities can accommodate up to 180 guests and are ideal for corporate retreats, seminars or personal events. 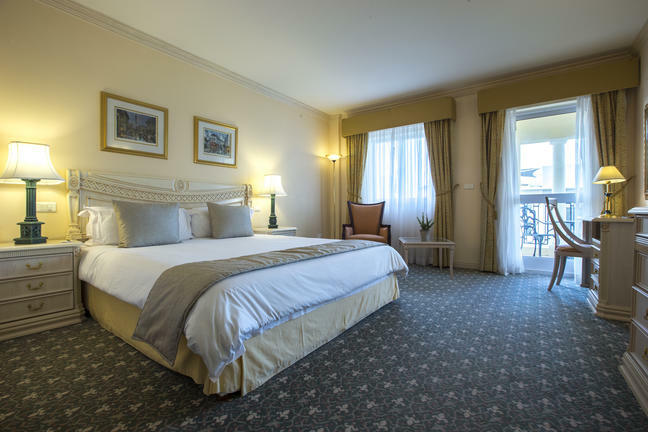 Our Standard Room accommodation in Port Elizabeth features a king-size or two twin beds and an open-plan bathroom with accompanying bath and separate shower. 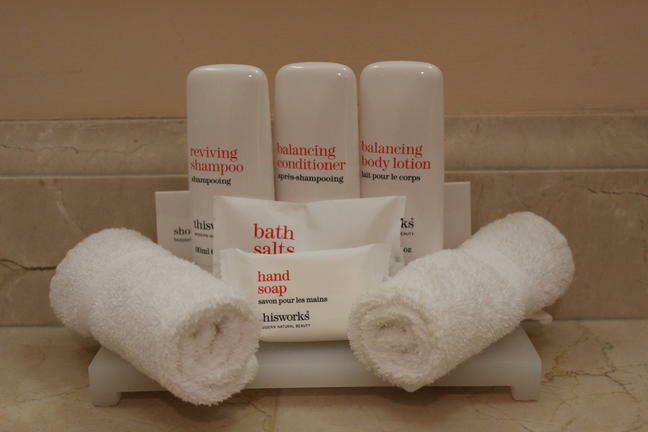 Enjoy Free high-speed, wireless Internet access, 1600 watt hairdryer and an in-room mini bar. 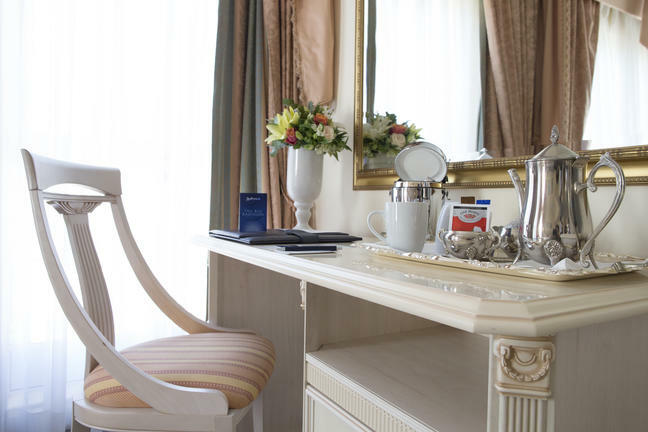 Our Business Class Rooms feature all standard amenities plus a daily newspaper. 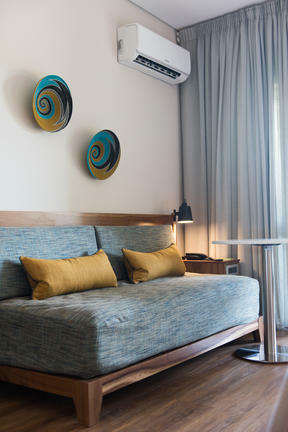 Guests can enjoy the spacious room layout with features like a sleeper sofa and built-in wardrobe and stay connected with Free high-speed, wireless Internet access. 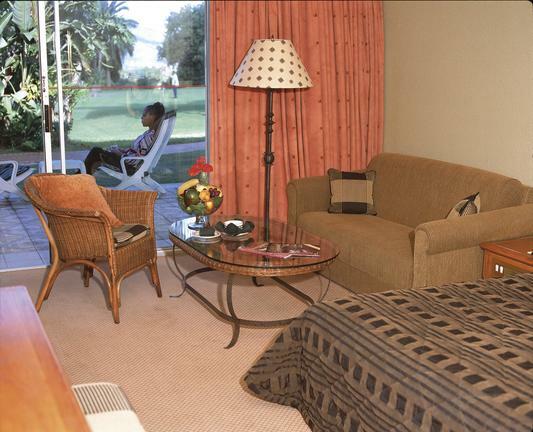 The Junior Suite accommodation provides Port Elizabeth guests traveling in larger groups added space and comfort. Feel at home in a king-size bed while enjoying a drink from the Nespresso® coffee machine. 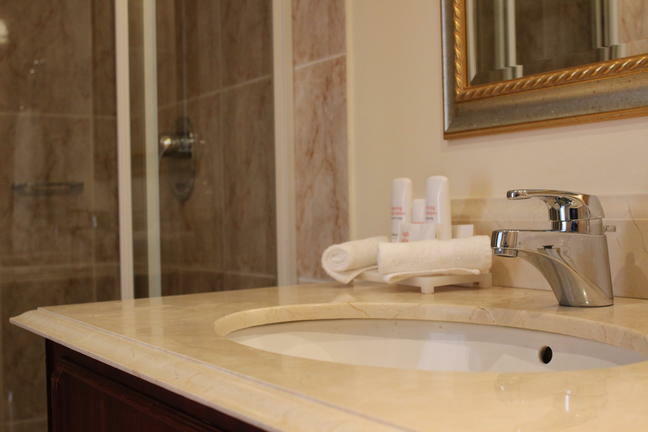 All standard amenities, plus the hearty Super Breakfast Buffet, are included. 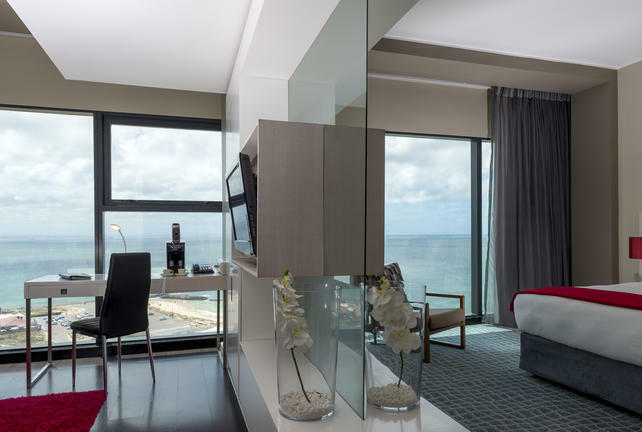 The One Bedroom Suite welcomes guests with complete with expansive sea views and Business Class amenities. A separate seating area and a spacious kitchenette allow you to make your own meals, while a lounge is the ideal place to relax or visit with friends. 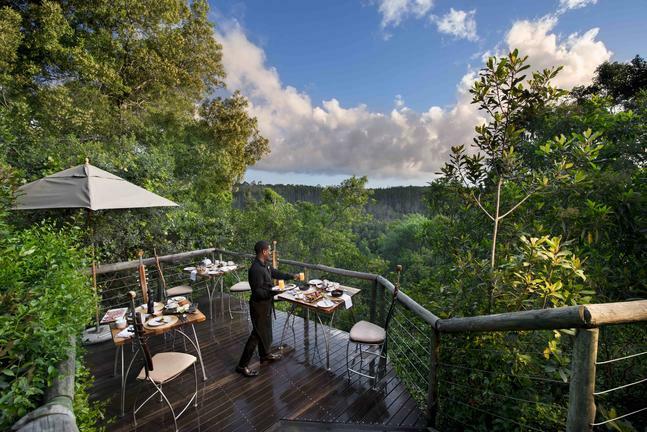 Hunter’s Country House is ideally situated between the coastal towns of Knysna and Plettenberg Bay in the Western Cape. 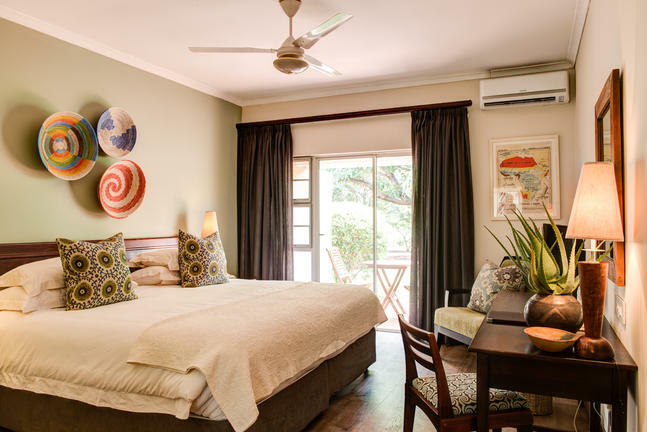 Accommodation consists of a variety of cottage suites, each equipped with air conditioning, a minibar, tea/coffee making facilities, hairdryer, internet access and a private patio. Certain suites have their own plunge pools. 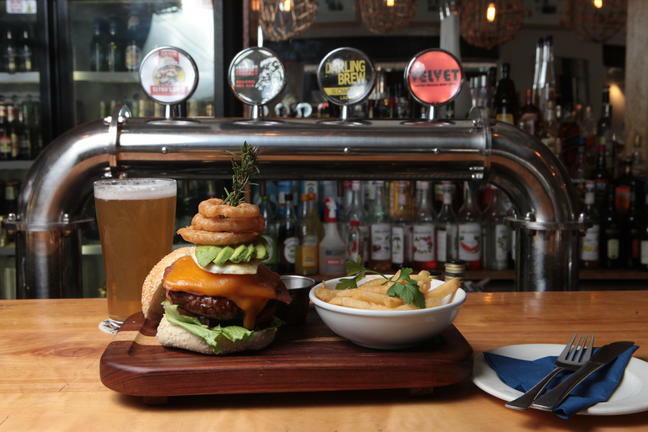 Guests can enjoy a range of delicious meals at either of the on-site restaurants. Other amenities offered are a large pool with loungers to relax on, a children’s playground and a lounge with a fireplace. 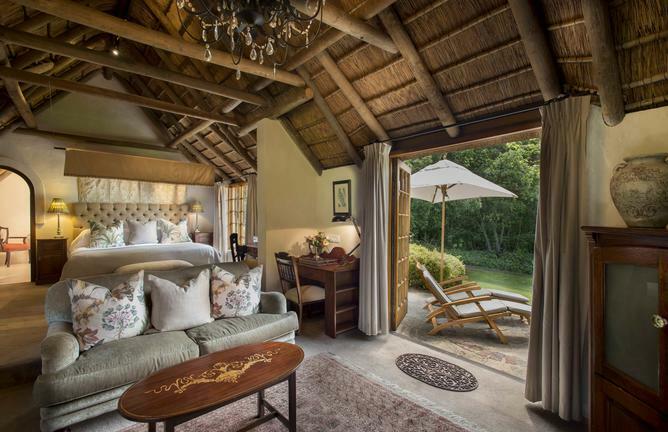 An intimate, thatched 25 square metre bedroom with king/twin beds, half bathroom en-suite with french doors leading onto outdoor patio seating area. 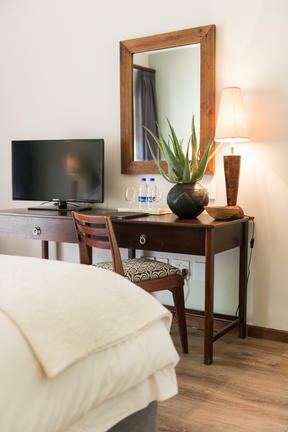 Each room is equipped with an air conditioner, mini bar, complimentary tea and coffee making facilities, hair dryer, flat screen TV with DVD player and bespoke amenities. 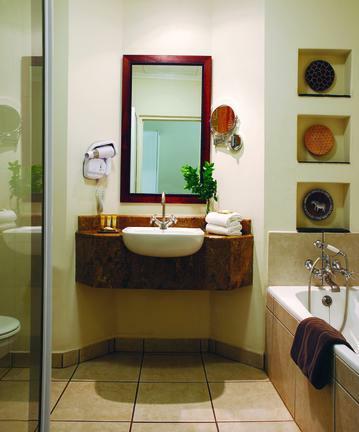 These 45 square metre suites are privately appointed in close proximity to the main pool complex. They are decorated with interiors that meld past and present using contemporary textural fabrics in a calming palette offset by antique polished pieces. 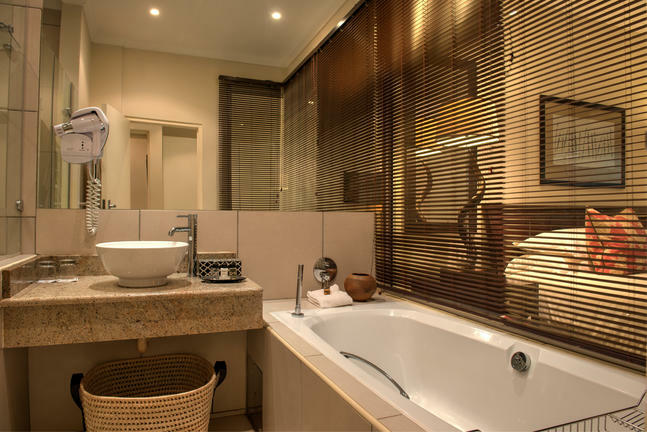 Each suite has an en-suite bathroom with separate bath and shower. 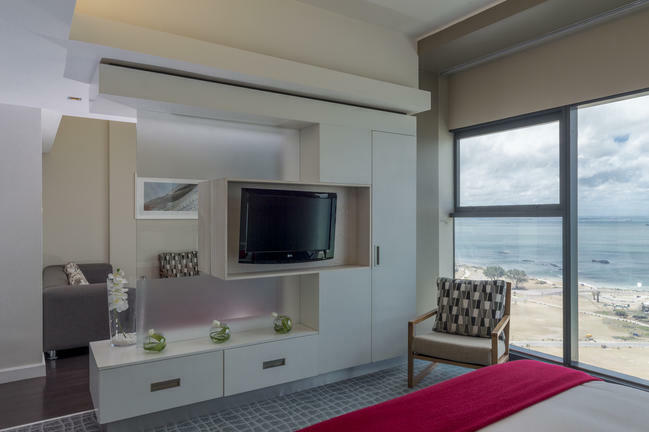 In the bedroom/lounge area you have a fire place, air conditioner, mini bar, complimentary tea and coffee making facilities, hair dryer, flat screen TV with DVD player and bespoke amenities. 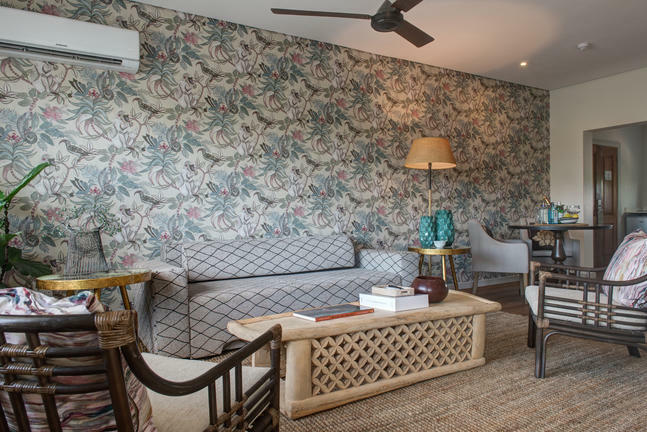 These thatched suites are privately appointed with interiors that meld past and present with contemporary textural fabrics in a calming palette off set by antique polished pieces. 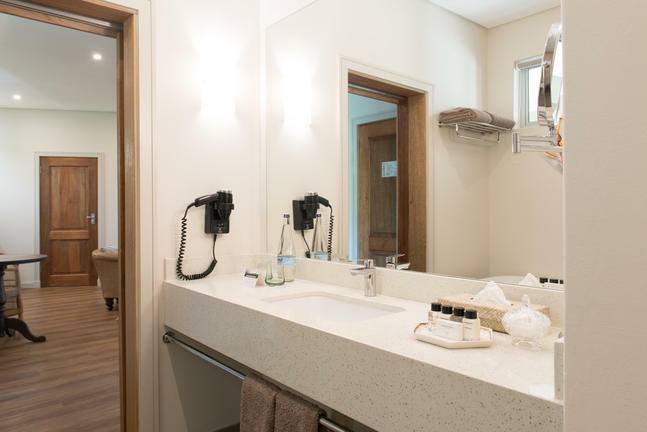 Each Garden Suite is approximately 45 square metres in size with en-suite bathroom, separate bath and shower. 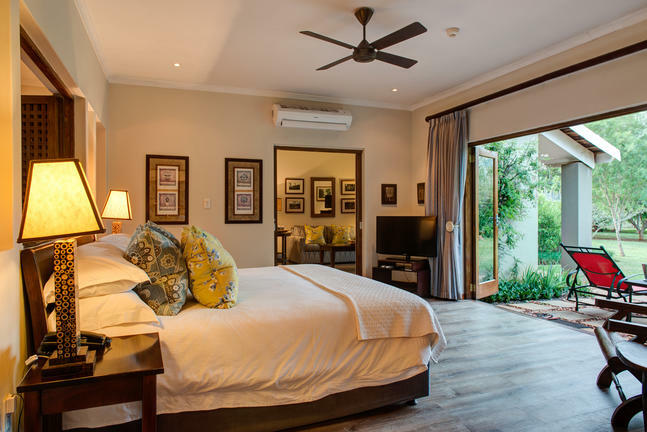 In the bedroom/lounge area you have a fire place, air conditioner, mini bar, complimentary tea and coffee making facilities, hair dryer, flat screen TV with DVD player and bespoke amenities. 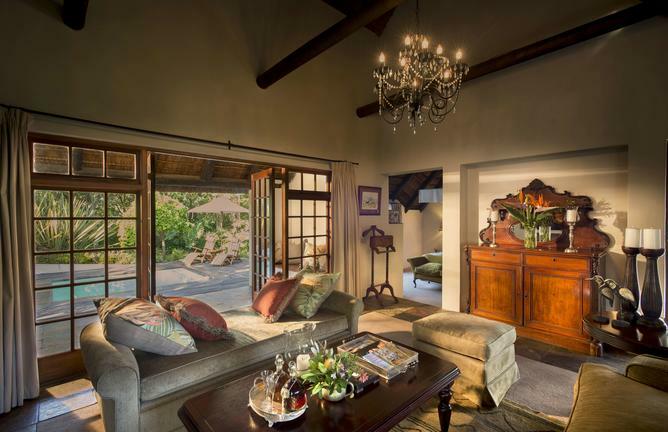 Each room has french doors opening onto a stone patio leading into the lush estate gardens. 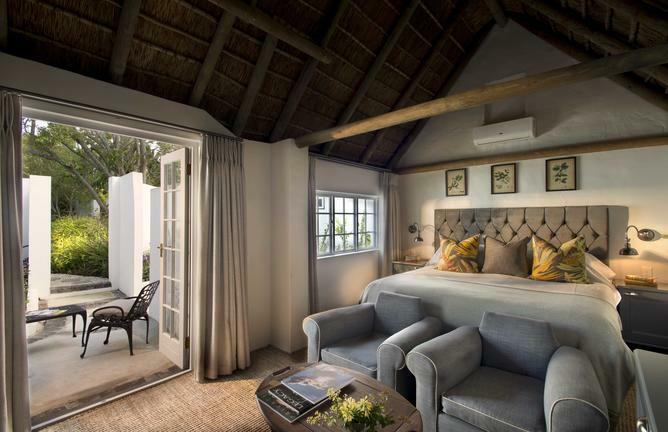 The thatched family suites, comprising of two large bedrooms each with en-suite bathroom provide for luxury accommodation, approximately 90 square metres in size. 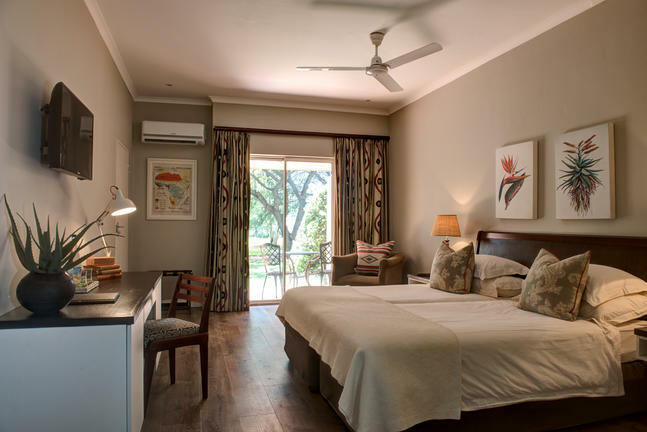 The parent’s bedroom offers a fire place, air conditioner, mini bar, complimentary tea and coffee making facilities, hair dryer, flat screen TV with DVD player and bespoke amenities. The second bedroom also has a fire place, air conditioner, mini bar, hair dryer, flat screen TV with DVD player and bespoke amenities. 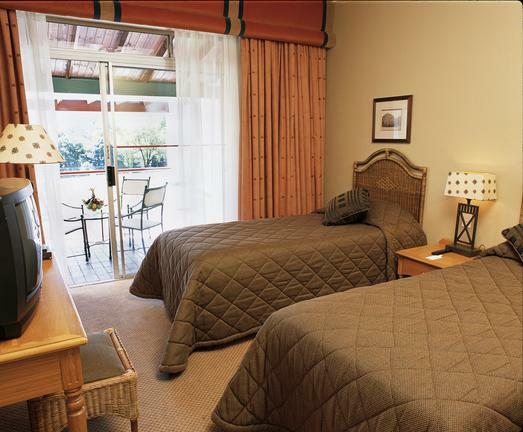 Each room has french doors opening onto a stone patio leading into the lush estate gardens. 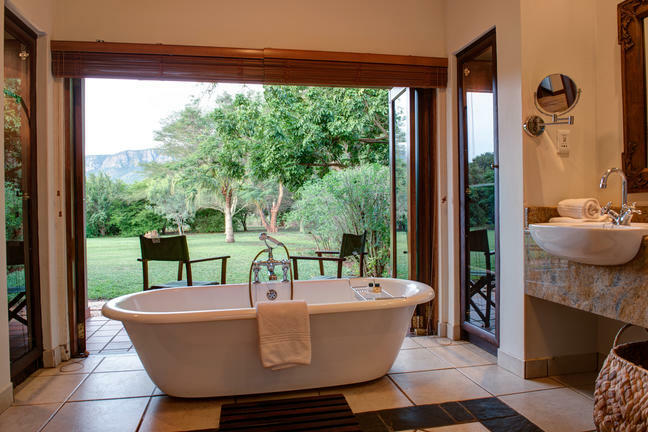 At 85 square meters, the thatched Pool Suites have a separate lounge and dining area with large spacious bedrooms leading onto a separate dressing area and large en-suite bathroom with his and her basins, bath and outdoor shower. 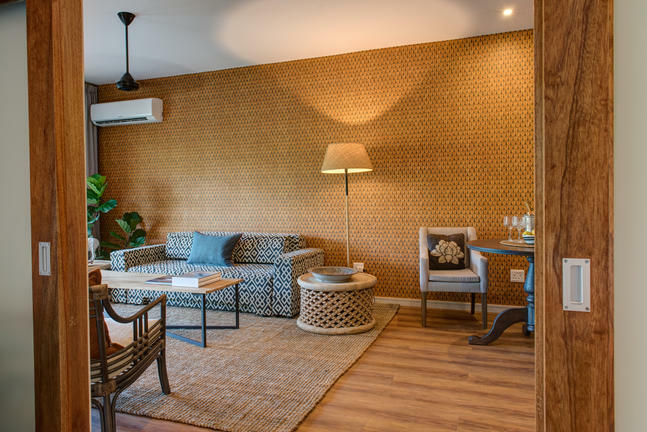 Each suite is equipped with fire place, air conditioner, mini bar, complimentary tea and coffee making facilities, hair dryer, flat screen TV with DVD player and bespoke amenities. The french doors open onto a stone patio and sundeck with a private pool overlooking the gardens. 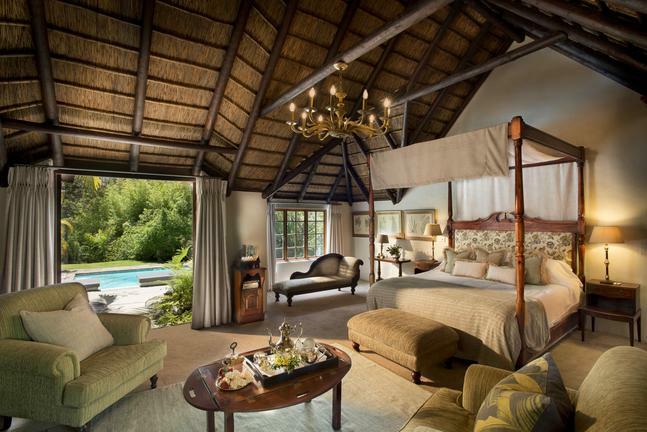 The thatched luxurious Family Pool Suite is approximately 125 square metres in size and comprises of two bedrooms each with en-suite bathroom. 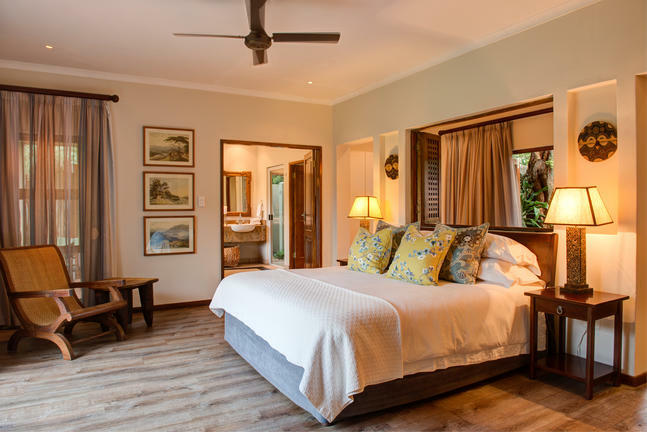 The master bedroom offers a magnificent king size four poster bed and intimate seating area, a fire place, air conditioner, mini bar, complimentary tea and coffee making facilities, hair dryer, flat screen TV with DVD player and bespoke amenities. 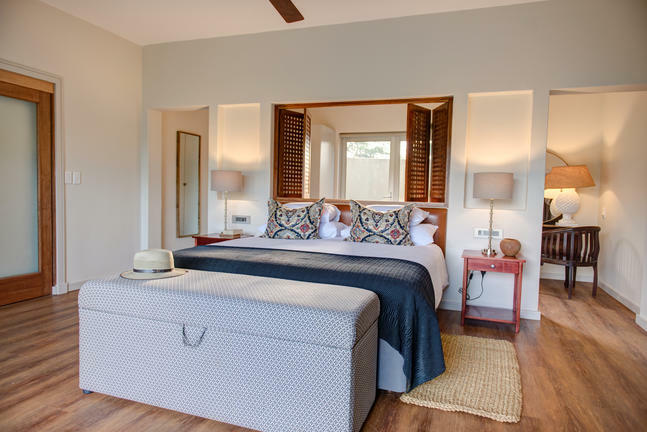 The second bedroom offers king/twin beds, air conditioner, hair dryer, en-suite half bathroom with shower and bespoke amenities. The french doors open onto a stone patio and sundeck with a private pool overlooking the magnificent estate gardens. 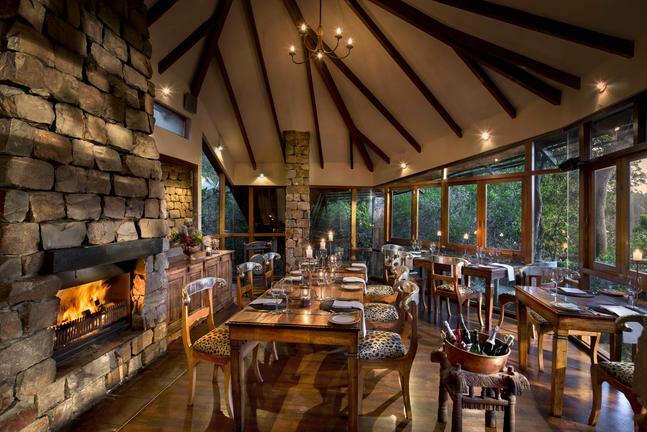 Enjoy refined country style dining at Sage @ Hunters or in one of the beautiful seating areas around the Estate, and choose from the a la carté menu. 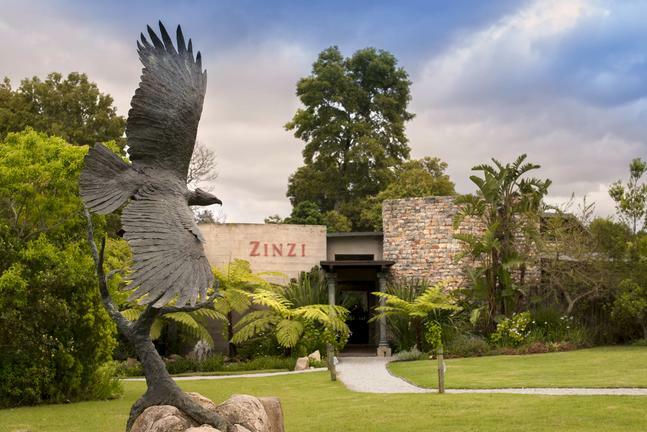 For a casual lunch or dinner a la carte style, our award winning Zinzi Restaurant is just a stroll from both Hunters and Tsala. All children welcome. A third option is the exquisite glass-walled dining room at Tsala which offers al la carte for lunch or dinner. Children 10 years and older welcome. 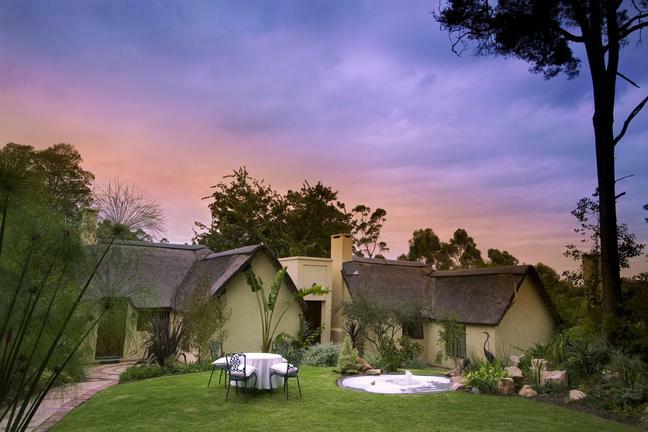 If you are a discerning traveler looking for luxury 4 star accommodation in the picturesque valley of Schoemanshoek, near the world famous Cango Caves of Oudtshoorn, then you need to look no further. 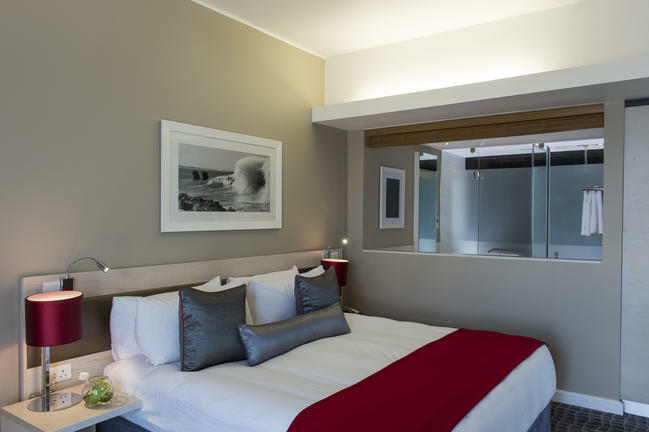 De Opstal is TGCSA 4 star rated and Portfolio accredited. 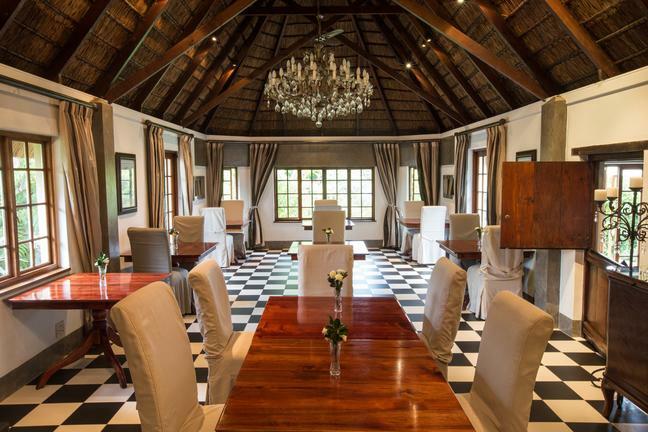 The beautiful farm house, stables and milking parlor date back to 1830. 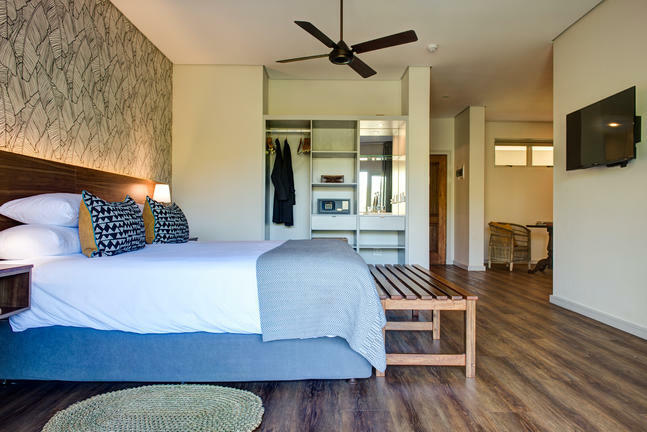 All the buildings in the complex have been creatively converted into modern, quaint en suite bedrooms with the retention of an atmosphere of rustic charm. 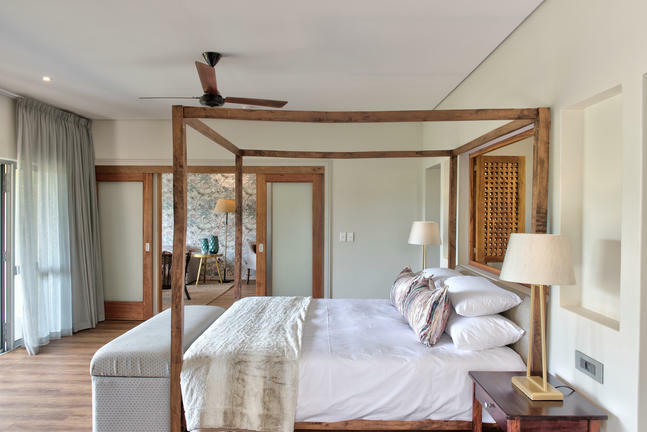 The terracotta floors, heavy wooden doors and shutters and wide timber ceilings bear the scars, buckles and blemishes of generations of use and give the entire complex an authentic feel. 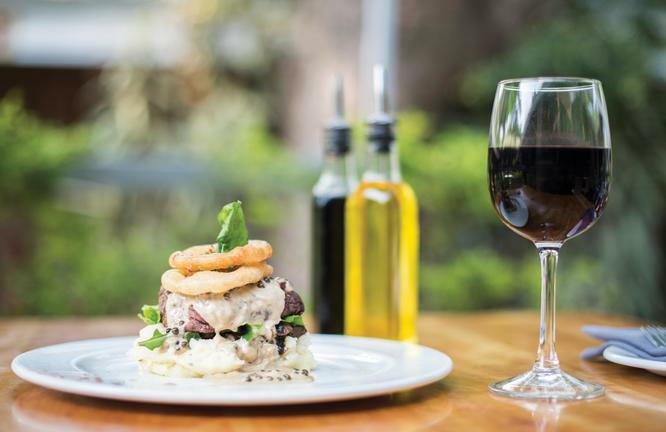 In this relaxed atmosphere Albertus, Matilda & Staff treat their guests to wholesome country hospitality and food, reminiscent of the bygone era of the 1800’s. Hearty farm style breakfasts are served in the spacious restaurant, which is also decorated in a style similar to the rest of the complex. 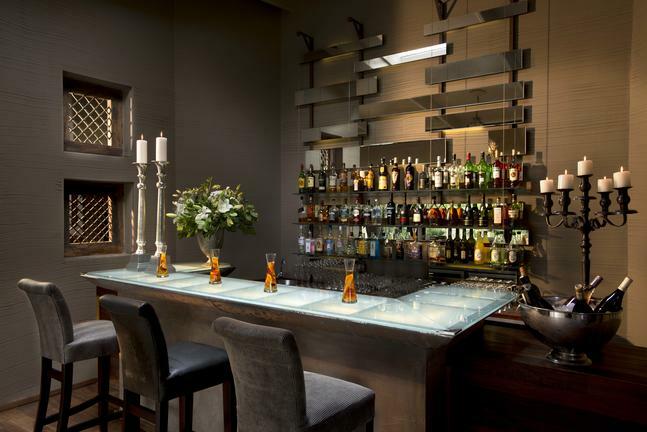 There is a bar area for pre–dinner relaxing. 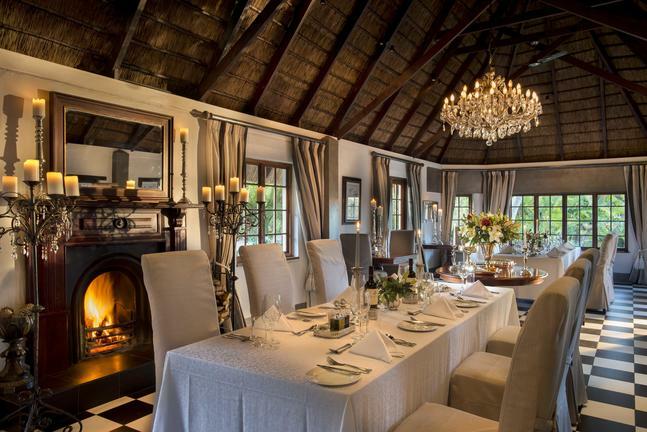 Dinner consists of an à la carte menu, prepared from ostrich and regional ingredients. They are also prepared to supply guests with picnic lunches on request. 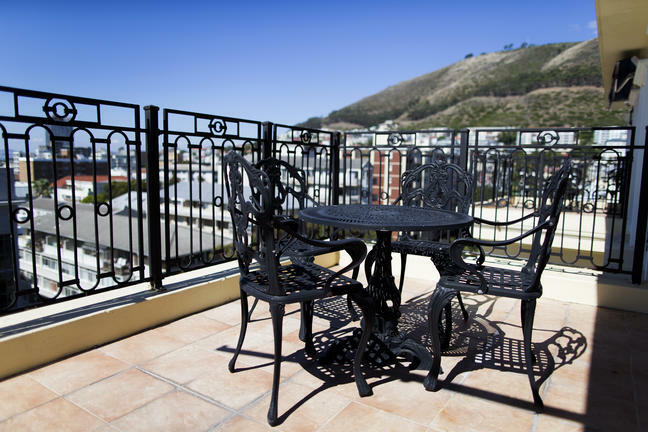 Situated in the Platinum Mile area of the Sea Point suburb, this Cape Town hotel is just minutes from the city center. 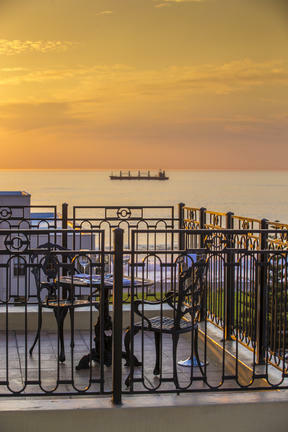 The district’s ocean promenade and the Victoria & Alfred Waterfront are within walking distance. Play in the surf at Clifton beach or scale Table Mountain’s 1,000-meter summit. 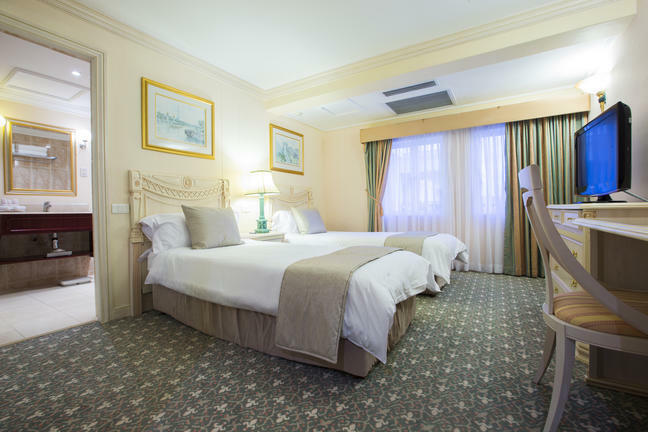 The hotel's 143 rooms and suites feature old world details and convenient amenities like free, high-speed wireless internet. 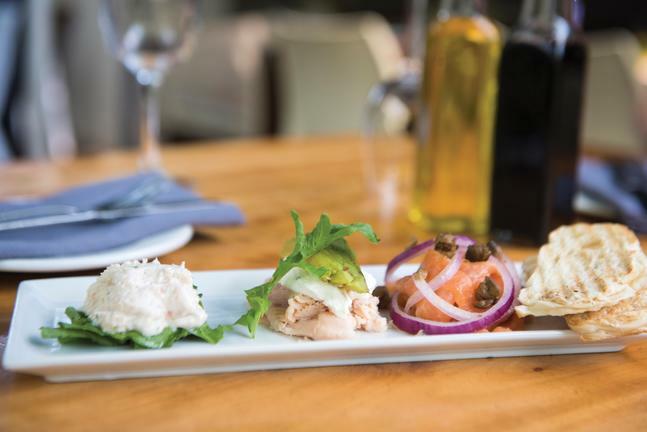 Guests can sample regional cuisine at La Mer Restaurant and Grill or relax at #add Restaurant and Pool. 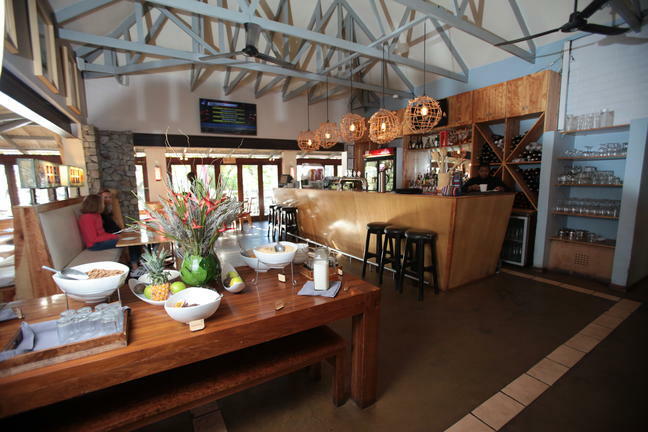 Cpoint Bar and Lounge welcomes guests to sample an array of local wines. After a day in the African sun, take a refreshing dip in the pool. 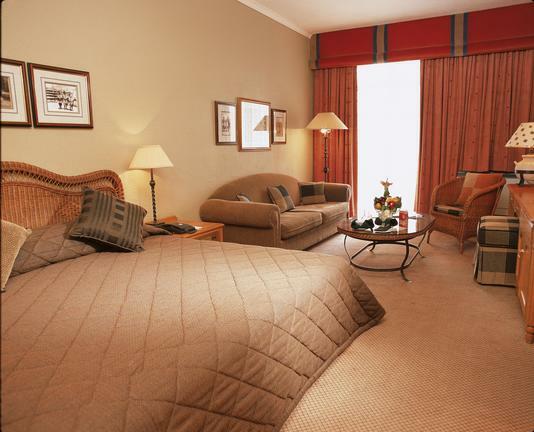 Well appointed rooms with a luxury feel. 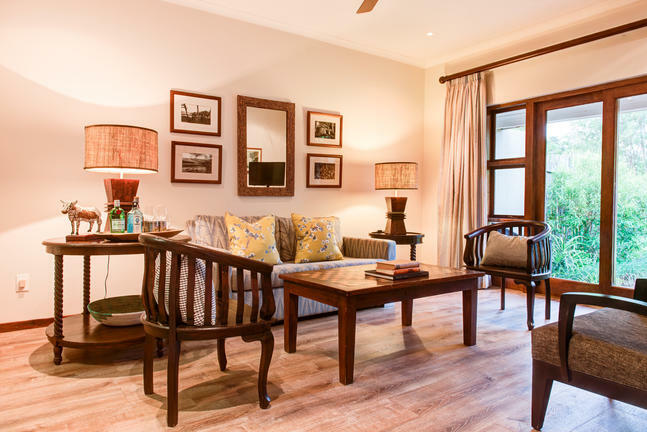 Comfortably designed these rooms have all the 4 star facilities to make your stay a delight. 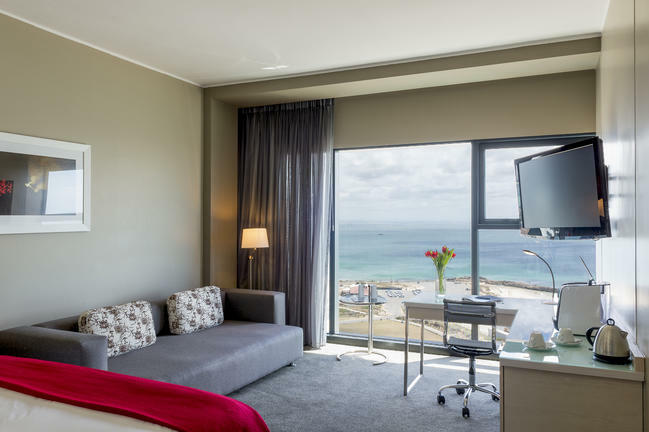 Luxuriously crafted, Superior Rooms have the extra space you need to truly relax at this seaside destination. 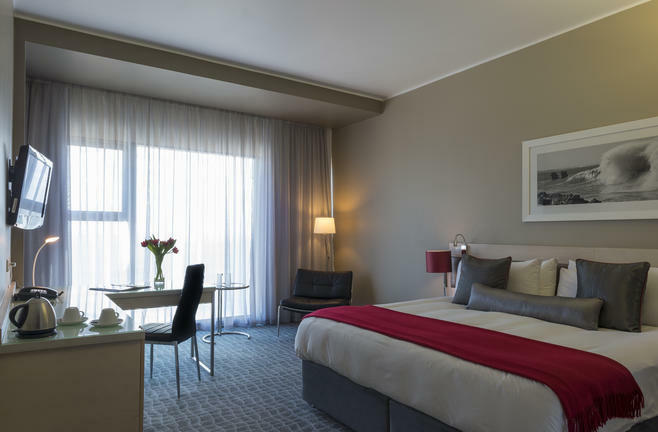 The 5 star amenitites associated with Radisson Blu make sure that luxury is an ease. 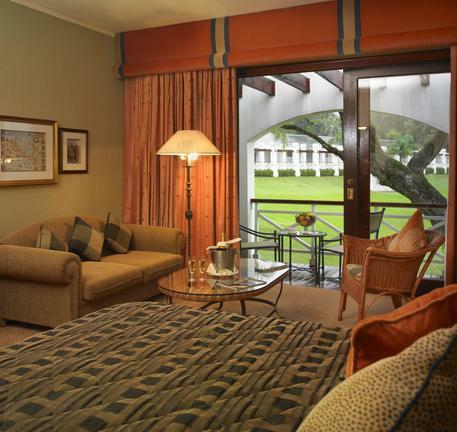 For the more discerning traveller our Business Class rooms are a cut above. 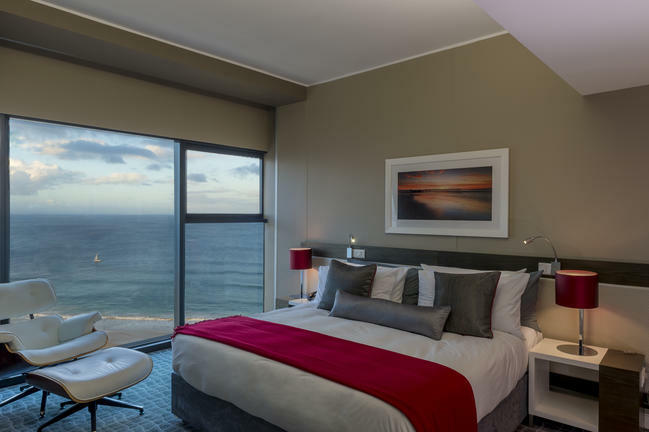 With Nespresso machines to give you the kick you need and balconies to break free and take in the Atlantic Seaboard and surrounds, this room type is for the consummate traveller. 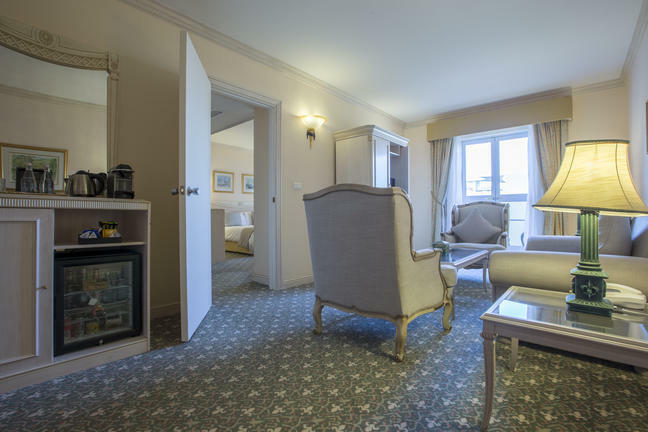 Our spacious Junior Suites have the luxury of a separate lounge area as well as balconies to view the glorious surrounds. 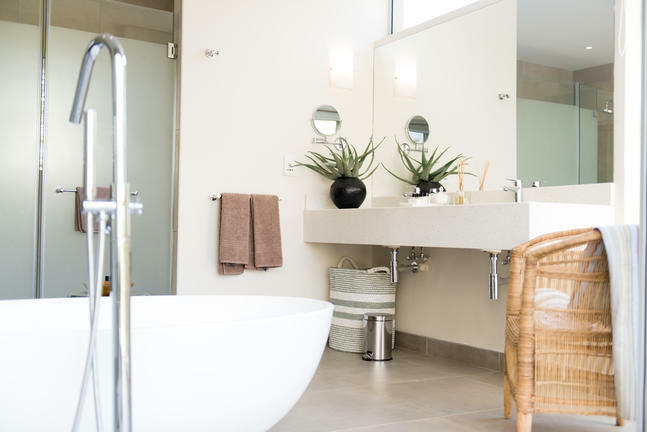 Functionally designed these rooms feel like you are in your own private abode. 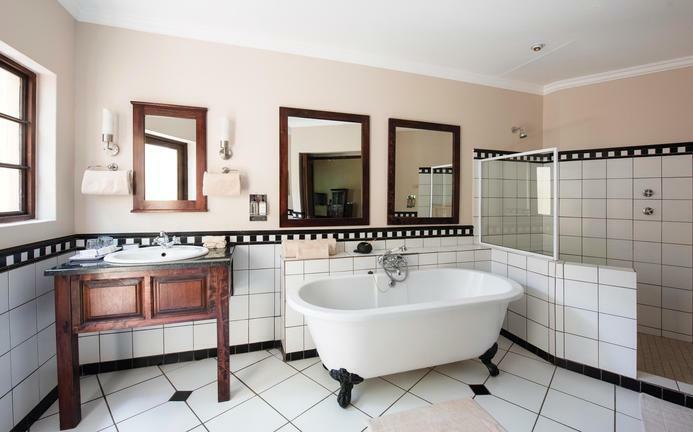 Palacial design, this 2 bedroom, 3 bathroom Royal Suite is a parlour for the pedigreed. Making one feel like a King or a Queen its majestic views and lavish décor transports one out of the ordinary and into a fantasy. 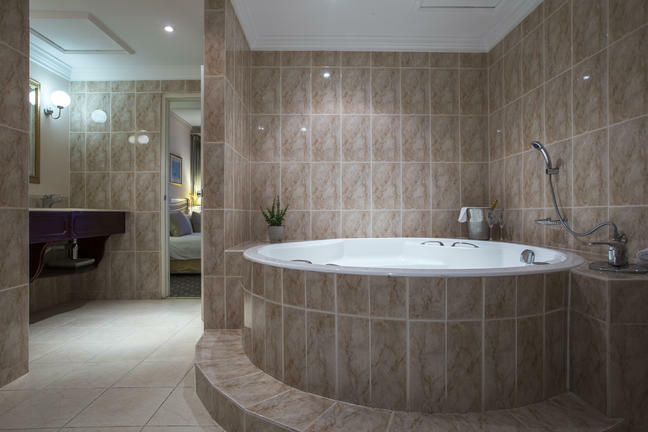 The Royal Suite bathroom and its spa bath is a sight to behold!